HID OMNIKEY 5325 USB Prox - OMNIKEY 5325 CONTACTLESS RDR, USB, CONF. 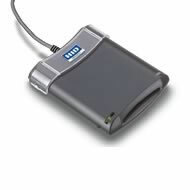 High-performance, USB smart card reader for desktop use that can be used with any HID proximity card. The HID OMNIKEY 5325 USB Prox is a high-performance, USB smart card reader for desktop use that can be used with any HID proximity card. Complete with a convenient card retainer and a robust housing, the OMNIKEY 5325 USB Prox is compliant with all industry standards. Designed to facilitate ease-of-use, this dual-interface (contact/contactless) reader works with your existing HID Prox cards enabling implementation of new logical access applications without re-badging. It not have a keyboard simulation. The HID R53250008-1 is also known as HID-R532500081	or R532500081	.